Thank you so much for your prompt and efficient service. My Panda has arrived safely and having been fed and watered he is being re-packed for the next part of his journey. 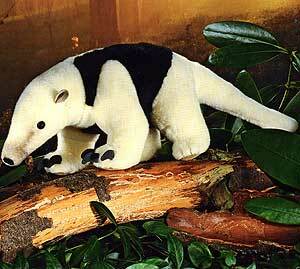 Kosen Anteater is made of the finest black and white woven plush. A wonderful soft Kosen animal. Product details: Kosen item number 6620, Pose: standing, safety eyes, synthetic filling material, surface washable only, total size 40cm. CE Marked - Safe for Children over 3 years. Always read the labels.